Are you in the market for a new watch? If so then you have a cornucopia of options including styles, features, and qualities. The global watch market was worth nearly $9.8 billion last year, and the value continues to increase yearly. One of the options you have is Seiko vs Citizen watches. These two companies have existed for at least a century. They’re also world-famous for their wristwatches in particular. We’ll be taking up some of the biggest issues to weigh when picking either a Seiko or Citizen timepiece. This is another key issue to take up when picking a watch brand. The company should respond relatively quickly if you have questions or concerns, for example. Refunds/exchanges, and warranties are some of the main issues that you might have to deal with after purchasing a wristwatch. A general complaint of today’s companies is after-sales service has declined in recent years. That’s generally the case with both Seiko and Citizen. Some consumers have even complained about the ability to find old-school watches like Seiko models with leather bands, for example. However, Citizen generally receives higher marks for customer service. That includes repairs, which tend to get better reviews than Seiko in terms of the speed and quality of those repairs. This is the nitty-gritty of any watch company, so it’s definitely worth taking up seiko vs citizen. Who does it better? Both companies have fans. Citizen often receives praise for its features like radio control, multi-time zones, and water-resistance. Meanwhile, Citizen watches have received some criticism for low-quality glow-in-the-dark hands. This is often the case even after watches have been in sunlight. If you’re looking for form over function, then Seiko is generally a better option. The manufacturing is also a bit superior as well. The Kinetic series don’t require batteries but must be worn regularly. The illuminated hands are also better than Citizen’s. Both of these companies have tons of experience in the watch industry. So you won’t have the same issues as when buying a watch from a generic or off brand. In that case, you’ll be more likely to deal with issues like low-quality products and bad customer service. That, in turn, will make your overall buying experience worse. You can find many Seiko watches that are water-resistant enough or swimming/snorkeling. It’s tougher to find units that can be used for diving. When picking a Seiko watch check how deep it’s water resistant for. Other watches have minimal water-resistance. For example, they’re protected from water splashes and rain but not showering/submersion. Before picking a Seiko watch make sure to check the water-resistance. This feature makes it easier to read the watch during nighttime and in low-light environments. In fact, Seiko’s illuminated hands generally function better than Citizen’s. In fact, this is usually the case even in bright daylight. Many Seiko watches feature a stainless steel case. This isn’t the world’s strongest material but is a good option in terms of durability, weight, and quality. Look for other features like hardlex crystal for extra durability. This feature provides watches with extra durability through scratch-resistance. Sapphire crystal is even sturdier but boosts the cost of the unit. So make sure how much scratch-resistance you want the watch to have. Seiko generally gets better marks vs Citizen in this area. Seiko watches include features like coin-edge bezel, 2-tone case, etc. These features boost the overall look/feel of the watch and make the units a good option in terms of how eye-catching the units are. Some Seiko watches have a sky-high power reserve of 40+ hours. This allows the watches to operate for tens of hours when not worn and adds convenience since it provides reserve power for up to two days of non-use. Some Seiko watches are automatic watches, so they require no batteries. They instead are powered by your arm’s movement. These wristwatches also include reserve power so the watches can function when the watch isn’t worn. Seiko watches feature Japanese quartz movement. This helps the timepieces to keep better time. In fact, Seiko has been an innovator in quartz watches, so it’s a good option if that’s what you’re looking for. This function allows you to view the current day and date. It’s a plus when you want to check the day or date at a glance. This feature is helpful even on old-school analog watches. Sometimes it’s easy to lose track of the current day or date so it’s definitely a plus when you can check your Seiko wristwatch. It can be a hassle to wind up a watch every time it runs out of juice. Some watches include hand-winding and self-winding functionality, so it’s a cinch. This feature provides ultra precision to the wristwatch. Special radio towers are used to transmit the exact time to your wristwatch. Then your timepiece adjusts to that time to provide you with ultra-accurate time. This technology collects power from a natural/artificial light source that the watch is exposed to. Eco-drive converts light to energy, which is stored in a lithium-ion cell that’s rechargeable. Eco-Drive timepieces prevent the need to fit/change batteries. That’s because you simply won’t need to purchase any batteries. Another plus of Eco-Drive is you won’t have any problems leaving your watch in the dark. In fact, after the game-changing tech stores power the watch can function in the dark for many months. This also makes Eco-Drive an eco-friendly feature. That’s because it prevents batteries from being tossed out, which usually result in landfills. Like Seiko models, you can pick from various water-resistant Citizen watches. These timepieces are often good options for water sports and pro marine activity. However, you typically can’t use them for scuba-diving. This provides accurate data about the current time in different time zones. In fact, some models provide this data for several time zones. This is a helpful feature if you do a lot of traveling since you can track the current time in different time zones. In terms of the strength and durability, this is easily one of the best options for watches. In fact, it’s arguably a better option than stainless steel. Not all Citizen watches have a titanium case, but it’s certainly a key feature that’s available for some models. You can find Citizen watches with anti-reflective sapphire crystal. This is a better option vs hardlex crystal in terms of scratch-resistance. So if you want your watch to have extra protection sapphire crystal is a better option vs. hardlex. This wristwatch doesn’t need the day to be reset and particularly on the first day of the month. That’s because the tech handles this task automatically. Perpetual Calendar “knows” the date and sometimes also the day, month, and year. In fact, you can even keep precise time/date even with irregular months like February and leap years every four years. If you live in a place with daylight-savings time, then you’ll need to make adjustments 2x a year. This isn’t major since it only involves moving the current time one hour forward or backward. Automatic watches don’t require batteries and are instead powered by arm movements. These watches also have a power reserve. They usually offer up to about 50 hours of reserve power. The indicator shows how much reserve power the watch has. These options show why Seiko has remained a popular watch brand for over a century. The units offer style/durability and low-maintenance. They also combine high performance and technical precision. One of Seiko’s biggest features is sky-high accuracy. In one year it maintains accuracy within 5-10 seconds. This is a plus over the average quartz watch that loses 15 seconds/month! Seiko offers a good blend of luxury/sport. So the owner never has to sacrifice price for style/performance. Besides that, the company’s watches are built to last. So durability/reliability can be assured for several years. Quartz Movement: The company’s quartz watches are considered among the top ones in the industry. Another plus of Seiko watches is they offer a wide range of watches for different budgets. You can likely find a Seiko watch that suits your preferences/lifestyle and is within your budget. This is a plus over other watch companies with fewer product lines. Citizen is now exactly one century old. It’s a famous brand of watches throughout the world. The company has been improving and expanding its product lines for decades. The products feature Eco-Drive, quartz, and mechanical movements. Citizen isn’t just famous for the company’s size. It’s developed several innovative timepieces including the first watch w/ voice recognition, the world’s slimmest LCD timepiece, and first diving watch with electronic depth sensor. These features have allowed Citizen to be an industry leader. The company’s watches include several features. They include Atomic Timekeeping and Eco-Drive. Another innovation is a bezel that can be used to calculate conversions including speed, time, and distance. Citizen’s tech is so innovative it’s become the US Open’s official timekeeper. It’s also a sponsor of other sports competitions like the World Figure Skating Championship. We’ve just reviewed Seiko and Citizen, which are some of the leading watch-making brands on the market. They’re both well-established brands. Citizen has existed for a century while Seiko is 135+ years old. Both companies make quality timepieces worth considering. Which company is “better”? Seiko edges out Citizen in terms of overall quality. It’s also a better option if you want to focus on aesthetics over functionality. Seiko’s illuminated watch hands are also better. If you’re more concerned about features and functionality than Citizen is a better option. For example, they produce some high-end wristwatches for diving and traveling. On the downside, their glow-in-the-dark hands have received many negative reviews. 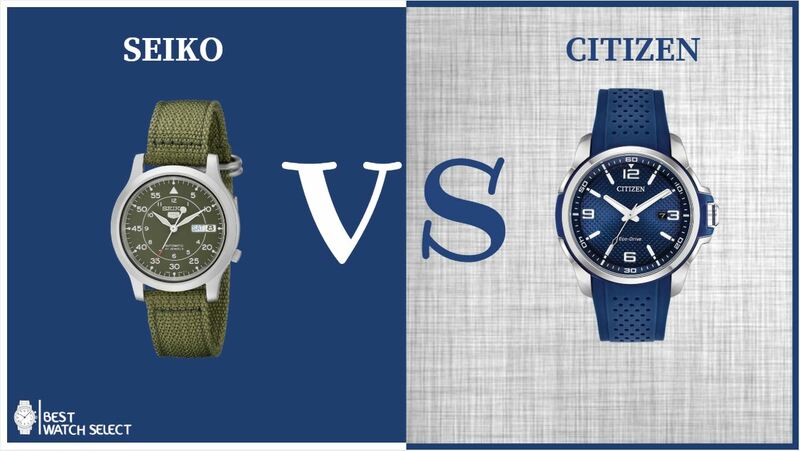 So in the seiko vs citizen battle, the “better” company depends on what you’re looking for. Should form follow function or should the converse be true? Spend some time thinking about that before picking your watch.